Dominant Social Theme: Central banks are not aligned. Chaos rises. A beast stalks Bethlehem. Free-Market Analysis: Have you noticed the disarray? China is squaring off against Japan and the United States over some funny little islands. Israel is furious with the United States over an Iranian pact and may go to war. And now the ECB is facing off with the Fed over monetary easing. All of the above are directed history at their finest, in our humble view. None of this is real. What is China anyway? It is lines on a map. Same with Japan. There are no Japanese or Chinese per se. There is culture, perhaps race and then there are elite and powerful Chinese and Japanese families that want to keep power and manipulate military conflict and economic chaos to do so. You can bet the topmost Chinese families and their assorted hanger-ons have more in common with top Chinese and Western families than they do with their own middle classes. Same with top Iranian families and also, of course, the central bankers that run monetary affairs for their masters. The people who control central banks are the masters. The rest are merely minions of the most wealthy, doing their bidding. Do the topmost men of Japan and China care a whit about some empty islands? Nope. Do the topmost men of Iran and the Anglosphere care whether or not Iran has nuclear weapons? Nope. Everyone has them at this point, or almost everyone. The topmost men of Iran and the Anglosphere are interested in expanding and maintaining wealth. The European Central Bank yesterday issued a warning of the threat posed by the scaling back of monetary stimulus in the US. It called on the currency bloc’s policymakers to prepare for the ill effects of Federal Reserve tapering. The ECB said in its latest financial stability report that the risks to the euro zone’s financial system from outside the currency bloc had grown since May on the back of the Federal Reserve’s talk of tapering its $85 billion worth of monthly bond purchases, despite a general improvement in market conditions. “Starting in May, there was a significant repricing in global bond markets, which took place largely because of changing monetary policy expectations in the United States – with increased foreign exchange market volatility and stress borne largely by emerging market economies,” the ECB said. The ECB warned that, while the euro zone’s institutional investors were more exposed to bond markets than the region’s lenders, it was difficult to know where the risks of ultimate losses were greatest. – See more at: http://www.thedailybell.com/news-analysis/34787/ECB-Warning-More-Directed-History/#sthash.2YkXWLac.dpuf……………………&#8230;. European Commission President José M. Barroso is searching for a new European Union narrative. As I have argued elsewhere, the EU needs a dream of the Martin Luther King Jr.-type if it wants to stay relevant for the European population. I agree with Barroso in seeing the EU’s lack of a positive vision as a threat to its democratic legitimacy by low public anticipation, participation and appreciation. Eurosceptics stand strong because the union has failed to arm its allies. At the moment the European Union is without a clear vision to mobilise and engage the public leaving its allies vulnerable to strategies of ‘divide and conquer’. The lack of vision gives rise to xenophobia, ethnic tension and conflicts between rich and poor. Yet the European dream has strong potential for a social Europe. I am writing to all my contacts on my emails to spread the word on my just published eBook The Myths and Realities of Teamwork. I am asking you to do likewise via email, Linkedin, Twitter and Facebook. I have provided some text below. Non Irish or sensitive audiences may need the last two lines (PS) deleted!! The author, David Wright, has applied thirty years team working experience to defining the team journey, assisted by 32 short case studies, 37 illustrations and one joke! PS. The book is published by a Danish company called Bookboon and they rejected the original title “There is no F in Team”, feeling only an Irish audience would understand the title! 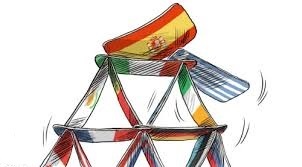 Standard & Poor’s lowered its credit rating for the Netherlands to ‘AA plus’ from ‘AAA’, while lifting its outlook for the struggling economies of Spain and Cyprus. Regarding the Netherlands, the credit rating agency maintained its outlook for the country at stable, but said its economic growth prospects were weaker than anticipated. “The real GDP (gross domestic product) per capita trend growth rate is persistently lower than that of peers at similarly high levels of economic development,” S&P said. The agency added that it expects the country’s GDP to contract by 1.2 percent in 2013, before growing by 0.5 percent in 2014 and slowly accelerating to 1.5 percent by 2016. It argued that real economic output for the country will not surpass 2008 levels before 2017. The cut means the only euro zone countries to retain their AAA rating at S&P are Finland, Germany and Luxembourg. What odds now on a 2nd and 3rd Irish Bailout/Bail in? Every savvy investor know that Deutsche Bank is B*0+*K and it is no surprise to see the latest downgrading coming from these jokers (S&P) Surprise! Surprise! They did not downgrade Germany??? This whole rotten financial disaster is about to revisit Europe and Germany is quietly getting its financial exposure off the table all over Europe! The really big surprise might still come with a German pullout of the Euro as a New Greek bailout or Default Is Inevitable and Germany doesn’t want to end up holding the Baby: Spain is now heading down the same road with bank lending to small business dropping off by 20% in the last 8 months so you don’t have to be a genius to figure out Spain’s Banks have no money and are Broke and someone has to start facing up to reality ! The European Central Bank has said the Government would need to seek and receive a new round of formal aid from the European Stability Mechanism rescue fund before it could consider buying Irish bonds to stabilise a crisis………………………………. ECB warns bailout exit limits Ireland’s options – Political News | Irish & International Politics | The Irish Times – Wed, Nov 27, 2013. Excellent piece of analyze on the financial morass of Europe .We in Ireland this morning ,are now been told according to Mr. Asmussen “Ireland no longer meets conditions for bank to buy Irish debt, and at the same time we read that the Standard & Poor’s lowered its credit rating for the Netherlands to ‘AA plus’ from ‘AAA’, while lifting its outlook for the struggling economies of Spain and Cyprus. How does this fit into you analyzes? For some time now, The Slog has been pointing out the inevitability of Greek default next Spring unless there is a change in the stony-faced attitude of Brussels-am-Berlin. A week ago, a Merrill Lynch note at last started debating the ‘inconvenient truth about Greece’. Now it transpires that secret negotiations between Athens and the Troika are under way about the promised then unpromised debt relief, and whether a further bailout of banks will be possible.